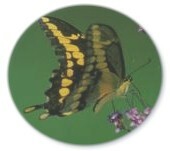 In 2003 twenty-eight participants found 1,366 butterflies of 44 species. The Ojibway Prairie Complex received the majority of coverage. Sites visited by counters included Spring Garden Natural Area, Tallgrass Prairie Heritage Park, Ojibway Park, Black Oak Heritage Park, Ojibway Prairie Provincial Nature Reserve, Brunet Park, Fairplay Woods and McCaliffe C.A. The count was hosted by the Ojibway Nature Centre. The Friends of Ojibway Prairie sponsored a picnic lunch and Pepsi provided refreshments. The weather on count day was poor for butterfly watching with cloudy conditions and rain in the morning. The number of total individuals was well below average (51.5 per party-hour). The cold wet weather in May had an impact on butterfly numbers by delaying the flight season of mid-summer species (but extending the flight season of early summer species). 67 species have been recorded over the past ten butterfly counts. Gordon Barnett, Maurice Bottos, Denise Bourgeois, Margaret Calder, Heather Anne Campbell, Karen Cedar, Ed Columbo, Mark Conlon, Paul DesJardins, Kristen Fawdry, Shirley Grondin, Tom Hanrahan, Barbara Hayes, Ben & Brenda Kulon, Jeff Larson, Betty Learmouth, Yunhui Lee, Phil & Judy Owen, Colleen Parks, Paul Pratt, Tom Preney, Neena Roumell, Ken Thorne, Ian Woodfield. Two Monarch caterpillars were also found during the count.